The information contained in this document represents the current view of Microsoft Corporation on the issues discussed as of the date of publication. Because Microsoft must respond to changing market conditions, you should not be interpret this to be a commitment on the part of Microsoft, and Microsoft cannot guarantee the accuracy of any information presented after the date of publication. This document is for informational purposes only. MICROSOFT MAKES NO WARRANTIES, EXPRESS, IMPLIED, OR STATUTORY, AS TO THE INFORMATION IN THIS DOCUMENT. Microsoft grants you a license to this document under the terms of the Creative Commons Attribution 3.0 License. All other rights are reserved. The DevOps concept focuses on how to build deep integration between Development and Operations, organizations who have historically been at odds. This has been brought about, in part, by the need to increase the velocity of delivery from development into production, while ensuring that the Production environments are always running. One of the big problems to solve is ensuring that everyone is working with the same processes, systems, and tools, throughout the product development and delivery cycle. The Operations team needs to know that what they are deploying has already been proven to work in Production, or spend critical time re-validating changes during “outage windows”. Automating system setup and configuration is not new, but historically the scripts were monolithic, requiring the Operations team to modify the core code when moving from test labs into Production. Separating the actions in the automation code from the environmental data (such as server names & accounts) simplifies the updates, and reduces the risk of error. In addition, by restricting changes to what is in automation scripts, updates can be validated in advance, rolled back if something bad occurs, and all common systems can be ensured to be consistent. The development of PowerShell Desired State Configuration (DSC) was based in part on these requirements. PowerShell DSC is a set of extensions to the PowerShell language that enable creating PowerShell functions that are repeatable, and by design scripts into are separated into components for repeatable actions, structural configuration, and environmental data. In PowerShell DSC, the separate components are called Resources, Configurations, Configuration Data. This separation of action from structure from data is a new way of scripting, and requires changes in thinking. PowerShell is new to most Developers, and the style of coding is new to experienced PowerShell users. The Visual Studio ALM Rangers are a special group with members from the Visual Studio Product group, Microsoft Services, Microsoft Most Valuable Professionals (MVP), and Visual Studio Community Leads. Their mission is to provide out-of-band solutions to missing features and guidance. A growing Rangers Index is available online. 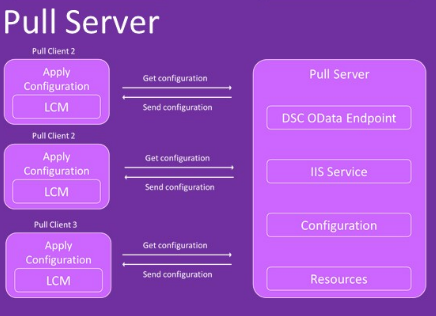 DSC is short for Desired state Configuration, and is a new way to manage deployments, that is fundamental different from traditional, instruction-based deployment. Instead of providing instructions for how to deploy your environment, you simply describe the Desired State you want to achieve in a PowerShell script file. You can then deploy or rather apply a Desired State Configuration to a server using the PowerShell engine. The Push model is the simplest one and gives you control over the events and configurations, since they start manually. 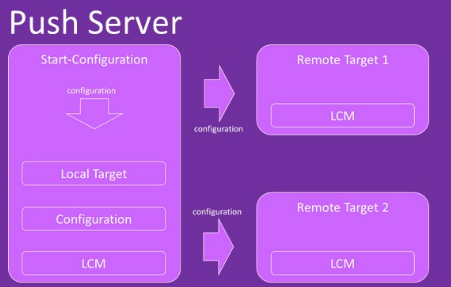 In the pull model, the target servers automatically pull the current configuration from a DSC Pull Server. The Pull model requires software installation and configuration, but provides scalability and conformability. The pull server allows a single repository of configurations. You can apply these to any number of VMs delivering a given role, hence giving scalability. Because this is a VM, we recheck its state against this pull server on a regular schedule to avoid configuration drift if you manually update a machine’s state.  Get-TargetResource – This method should receive the keys of the resource and return a hash table with all the resource properties as configured on the system.  Test-TargetResource – This method receives the keys and properties (as defined in the schema) and checks if the current configuration for the resource exists in the system. If any of the property values do not match the resource instance, $false should be returned and $true otherwise.  Set-TargetResource - This method will called to guarantee the resource instance matches the property values. This method must be idempotent so that after it DSC runs the method, DSC must ensure the resource instance is exactly as defined. It needs to be able to create a resource from scratch or to make some changes to an existing resource to make sure its state matches the state defined in the configuration. 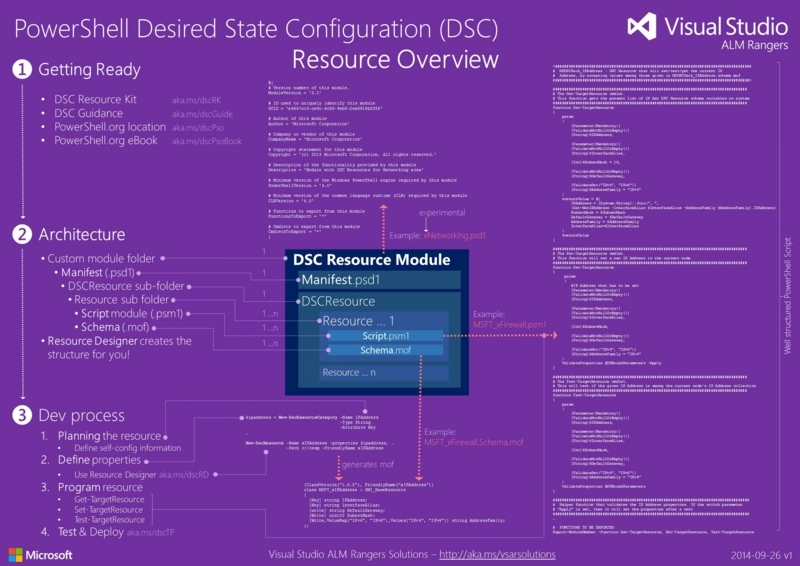 The following flow diagram summarizes the setup, development and deployment steps you should consider when you start building your custom DSC resources.  Select Report a Bug and then the type of bug you want to report (code, documentation etc.).  In the Bug report form, be sure to add the module and/or resource name to the title where applicable and then describe the problem with as much context as possible. In the interim please post bugs to the resource kit location where you found the resource or contact us. PowerShell DSC provides a mechanism for achieving configuration as code on windows platform. You are determining infrastructure with code when you define a script that describes in an objective and practical manner the desired configuration for any given infrastructure. Configuration as code leverages many possibilities, especially when it comes down to automation, among other benefits. However, it is crucial to keep in mind some inherent aspects that may potentially lead to problems and difficulties. The main idea here is to show those aspects, how they may affect you, and what can be you can do about them. Putting your configuration files under source control will allow you to maintain a history of all the changes done to them. In addition, having them under source control facilitates backup processes, avoiding situations where scripts may be lost. With the proper branching strategies, we can make changes in parallel as well optimize productivity. Like any other code, testing is crucial for delivering reliable solutions. The same applied to configuration files: thoroughly test them in test environments before deploying them to production environments. Make sure that everything works as expected; otherwise, any problems brought by malfunctioning configurations may be hard to track down. A pull server will keep all the production configurations in one place, with the machines configured by it constantly pull the configurations they use. This leverages updating configurations, since you would just have to update a configuration file at the pull server and the machines that use it will pull it and update their configuration themselves. Imagine that you need to update 100 servers using the same configuration - a pull server allows you to do it easily, instead of updating one by one. When machines are manually changed, this means you are not tracking these changes into the configuration script – you would have to do this manually, which might be unreliable. Manually changing a machine will present some challenging situations when applying the same configuration to another machine, since there will be no way to ensure that the configurations are the same. Sometimes, you may need to roll back the configuration changes for various reasons. For those situations, most of the time you just have to pick up a previous version from the configuration script and apply it“, which means you must save versions of your PowerShell DSC configurations to support rollback. However, reality tends to be more complex, and you will need to re-run the previous configuration scripts.